How many Citroën mechanics does it take to change a lightbulb? One to remove the front bumper, the second to unbolt the headlamp unit, take it out and remove the old bulb. Then replacing the new bulb is a doddle. All you have to do then is rebolt the headlamp, ensuring it is accurately aligned, and replace the front bumper. Oh — I forgot, you have to take the front wheel off to do this. Total labour time: 1 hour 30 minutes. Here’s a status update on my last post, Quite A Day. So they’re both on the mend. What a relief. The NHS has covered everything for Yvonne, but Milo chose to go private. Luckily we took out insurance for him and they have just confirmed they will cover our vets’ bill. Phew. First of all, we must welcome Benjamin Robert Lloyd Ellis, who arrived here on July 13th at 22:02. Congratulations to Jane, David and big brother Nathaniel! All seemed pretty good yesterday. Von had made an interesting shopping list for goodies for my birthday today. Milo was subdued and a little off colour, but seemed relatively OK. Von ran downstairs to let the electricity man in to read the meter, spun round at the bottom of the stairs and collapsed in agony. The loud crack from her foot did not herald good news. 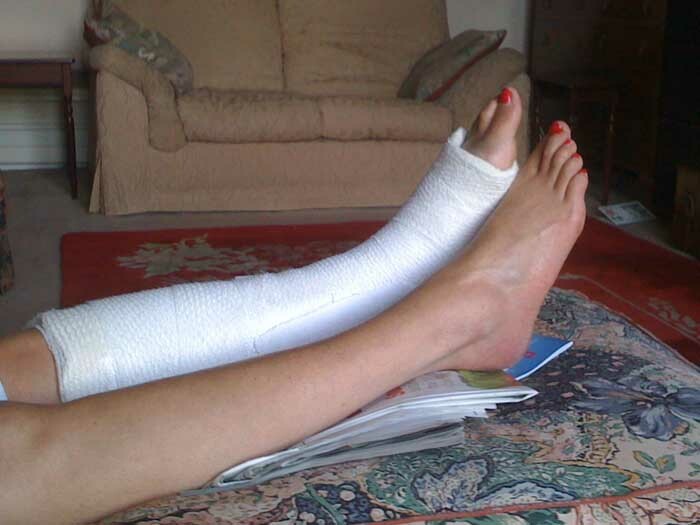 I was piling ice onto her ankle when my sister Jo rang. “Get her to an X-ray at once,” ordered Jo. She’s a physio and she knows these things. We drove to the Whittington and she was admitted into A&E, together with a felon handcuffed to a police officer and a madman staring at his tattoos and constantly shouting at himself. It’s a gritty city. I’d gone home to await her call. Four hours later, by 7pm, I was getting anxious. I checked my phone — and found I’d switched it off in the morning to stop it downloading another 200 emails, and forgotten to turn it on again. And I’d switched the office phones over to Moneypenny, our secretarial service. Von had been calling me since 5:15, when she was let out. I got her voicemail message and rang her immediately, but she was already in the taxi coming home. She was angry and upset but she didn’t want to spoil my birthday. Plaster up to the knee (left leg) and two crutches. She was not a happy bunny. I prepared a fish soup following instructions shouted through the kitchen hatch. It was delicious. We wrapped the plaster in clingfilm so she could turn over in bed more easily, and to stop it messing the sheets as it’s a hard/soft plaster (because she has a bruise like a balloon) and it was still slightly damp. I got up to make tea in the morning and the hall floor was awash with Milo’s vomit. He looked terrible, my effervescent pup who usually does somersaults at the sight of food. A Bonio held no interest for him. He would not eat. Off to the vet. The vet has just called. Milo had an X-ray, and a blockage was found in his intestine. General anaesthetic, on to the slab, cut him open and inside the intestine was a large stone, too big to be passed. 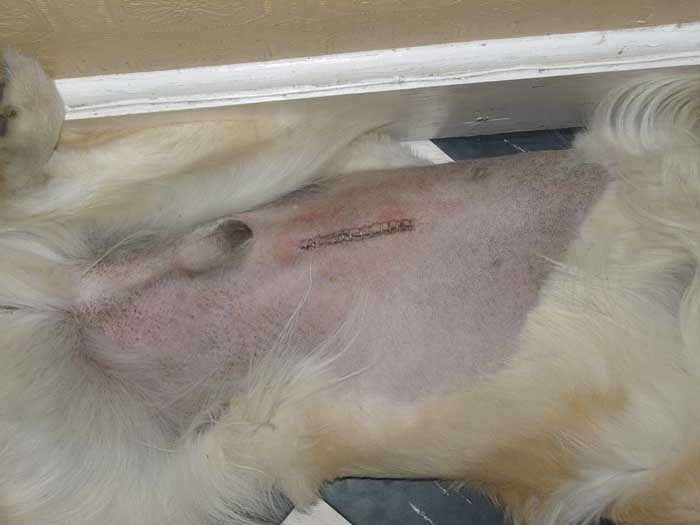 Stone removed, dog sewn back up, coming round from anaesthetic, all seems OK, job done. We get him back on Monday. I shudder to think of what the bill will be, although we do have some limited form of pet insurance. Whereas I dropped Von off at the hospital at 3:00 and if I’d had my phone on (doh!) I could have picked her up at 5:15, fully X-rayed, diagnosed, painkilled, plastered, given a pair of new crutches and a pile of drugs. All paid for by the NHS. Quick, efficient and polite. Don’t knock it too much. The alternative is not worth considering. So here we are. Von lying on a sofa with plastered foot in the air, dog lying on marble slab in alien vet office, and me celebrating my birthday with an Apple Inc product. Happy Birthday To Me! OK, the days are drawing in, and fast falls the eventide. Why am I thinking this way? Because last week a lady offered me her seat on the bus. So in a spirit of closure, I offer this short list of the top ten books I’ve enjoyed through my all too short life (the Bible and Shakespeare are included by default). They’re listed alphabetically by author, because rankings are invidious. If I’m spared, I’ll follow this up with films and records. I’m an unashamed traditionalist when it comes to painting. I certainly don’t dismiss modern or abstract art, but I usually find more to enjoy in figurative painting. And I’m a sucker for plain simple craftsmanship; the miraculous ability to capture a glint of light with a casual stroke of the brush, a fold in a satin cloth. It must be innate. I’m sure it can’t be taught. I play the guitar. I’m not very good, but I do know all five chords. Recently I’ve been practising Amos Garrett’s sublime guitar solo, one of the finest ever created, on Maria Muldaur’s “Midnight At The Oasis.” And now, after ten years or so, I can reproduce it pretty accurately. It sounds similar. You can tell what it is. But what I could never do in a million years is conjure up that glorious waterfall of notes by myself. Amos Garrett fleshed out David Nichtern’s skeleton chords to create a beauty worthy of John Singer Sargent. My use of the same material comes out more like Frankenstein’s monster. I can copy, but I can’t create — musically, at least. This is all getting somewhere, and it leads to a line. It’s a simple, brief, slightly kinked monoline, and it delineates the backbone of a cow. 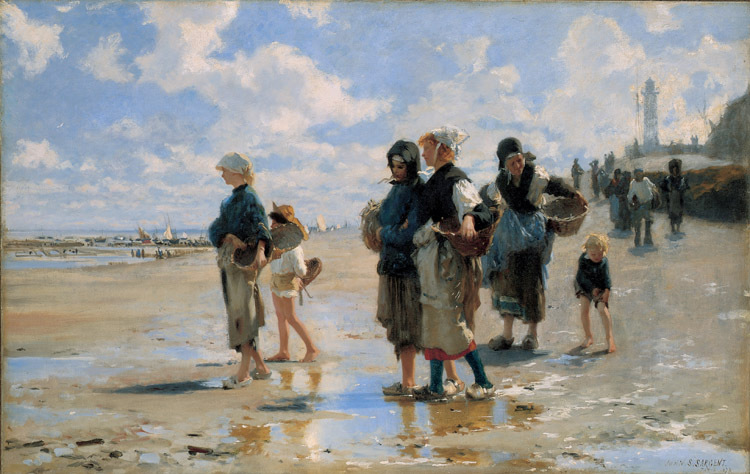 At the John Singer Sargent exhibition “Sargent and The Sea” at the Royal Academy, the great European portrait painter (of American parentage) shows a different side of his genius — his affection for the sea. The small exhibition ranges from large oils as seen below, to tiny dashed off pencil sketches. One sticks in my mind, and I’d show it to you if I could. On a small scrap of paper torn from a notebook, Sargent rapidly sketched a herd of cattle in the hold of a ship, seen from above. A simple stroke of the pencil — not studied, just drawn — marks the backbone of one cow. Neck slightly twisted, this one cow is angled a fraction away from her sisters. This simple line of pencil, barely an inch, is something I could never hope to emulate. Sargent saw it and recorded it, probably without thinking. It was just what he did. There’s no rubbing out and repeated attempts, there it is. A bovine stroke of genius. But for one so famous at conveying the human face and form, our hero sometimes seems to falter at this exhibition. 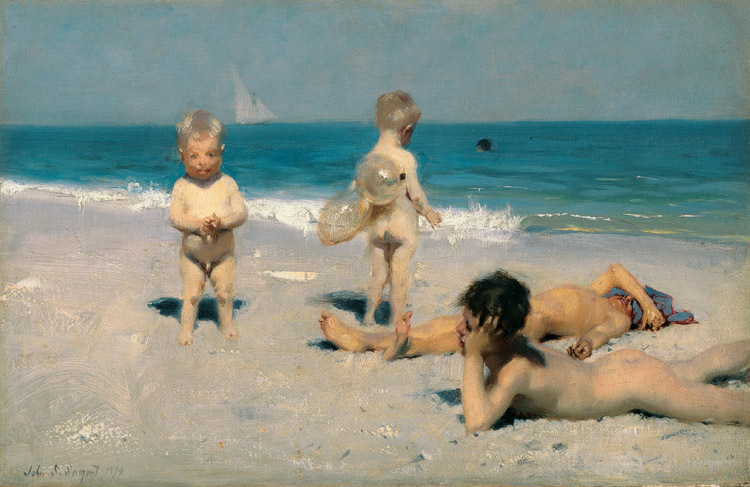 Take this “Neapolitan Children Bathing”, painted in 1879 when Sargent was 23. You can feel the heat, you just know the languid carelessness of the two boys lying on the sand, the arm flung over to shield the eyes is perfectly observed. And the attitude of the toddler staring in bewilderment at the painter is so true to life. But what happened to the toddler’s face? Is it unfinished? Was the child deformed in some way? It is a dreadful mess, especially from such a gifted portraitist as Sargent. I am baffled. The rest of the scene is faultless. I love the pigs’ bladders in use as waterwings. But that face! Even Homer nods. I cannot find any fault with “En Route pour la pêche” from the previous year. For me this is a masterpiece. Everything about it works for me, especially the contre-jour lighting and the reflections in the puddles. Perhaps the startling thing is the freshness and vivacity of the original, utterly missing in this drab digital reproduction. The painting sings. The whites are whiter, the blues bluer, the summer day is eternal. It is fabulous. This exhibition has been organised by the Corcoran Gallery of Art in cooperation with the Royal Academy of Arts. Well done Rafa Nadal. But spare a thought for poor Ramon Delgado of Paraguay. So effectively Delgado came bottom of the pile. I’m a loser baby, so why don’t you kill me. There should be an award.